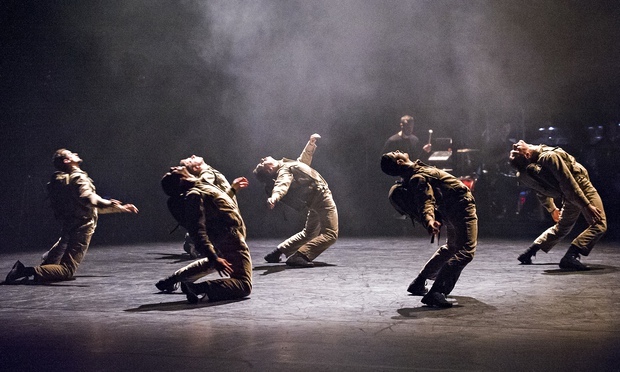 A co-production of BalletBoyz, Sadler’s Wells Theatre and 14-18 NOW, WW1 Centenary Art Commissions, Young Men is an entirely new modern dance work, with original score and designs. The piece is an ideal fit for the Sadler’s Wells venue and its devoted audience of dance lovers. Choreographer Iván Pérez has created the work on the 11 male dancers of BalletBoyz, as well as two guest female dancers. Using a deliberately abstract, non-linear style, Pérez has conceived ten sections that cover facets of the training, experience and ongoing trauma of young men involved in war. There is no particular agenda or message being pushed; rather, the piece gives the audience the prompts and the space to think and reflect. In “Desperate Disguise,” one of the female dancers portrays a woman going to the front to be with her man. The non-romantic nature of the overall piece is exemplified here, in that the woman is violently kept from her man by another pair of soldiers. “Shell Shock” is a particularly effective section, in which the mental anguish suffered by a soldier is portrayed in the unrelenting physical contortions his body continuously forms. He is seen to be given comfort, but there are, of course, no easy answers. The show is at its best when all 11 male dancers are in full flight. There is a strong sense of trust and innate communication between the men, as they run, leap and fall with a high level of abandon that would not be possible otherwise. Keaton Henson’s score has a similarly abstract feel to complement the dance. There are snatches of melody, but more often the effect is that of a haunting soundscape, the deliberate use of repetition giving the piece a driving insistence. The music is expertly played by 14 musicians, who are housed upstage behind sheer panels that are often textured with projections. Given the basic black box stage in use, Jackie Shemesh’s lighting is a significant and striking element of the production. Rows of side and overhead white lights show the dancers in stark relief or cast shadows and silhouettes. Dancers easily enter and exit from the inky blackness upstage. Carlijn Petermeijer’s dark-toned, comfortably fitting costumes adding to the air of quality of the production. Young Men was reviewed 4pm 18 January 2015.